IT admins are shifting their businesses to the cloud with Microsoft Office 365 in droves. With 70 million active users and counting, O365 is one of Microsoft’s fastest growing products ever. Office 365 shifts from the local Microsoft Exchange server and on-device Office suite to a hosted email solution. It also enables organizations to leverage a cloud productivity suite or maintain their on-prem Office solution but with cloud enhancements such as storage. But whether this is your first time dealing with SaaS-based apps, or if you’re a battle-tested veteran of cloud infrastructure, the big challenge has been getting centralized control over all your resources. That’s why many IT admins are looking into whether or not O365 can serve as a unified cloud directory. Office 365’s directory services capabilities are limited. So how could we say that O365 could serve as the type of directory that could unify all of your IT resources? As it stands, Office 365 is basically a local, ‘mini-directory’. What we mean with that statement is that the identities populated in O365 are really for Microsoft Azure and Azure Active Directory. For those migrating from on-premises equipment to the cloud, a legacy Active Directory instance can be limiting. Making the leap to the cloud with O365 is a great step, but the Microsoft-based directory services infrastructure doesn’t go with it. Those identities aren’t easily exportable to all of the other IT resources that your users need such as their laptop or desktop, servers whether hosted on-prem or in the cloud, legacy applications, new age SaaS applications, or networks such as your WiFi network. Organizations end up creating a variety of mini-directories for each of those resources. Or some are leveraging the on-premises, legacy Microsoft Active Directory which creates another set of issues. IT admins now have two places to manage their infrastructure – on-prem and in the cloud. That then cascades into multiple directories – one on-prem, AD, and one for the cloud, Azure AD. Toss in your AWS cloud servers, your Mac and Linux machines, your WiFi network, remote workers, and now you have user identities all over the Internet and world. That’s hardly a unified cloud directory services solution. There is a way to centralize all of these various resources whether on-prem or in the cloud. It’s called a unified cloud directory or more specifically, Directory-as-a-Service®. As you move to the cloud with O365, those identities can be leveraged throughout your IT infrastructure. 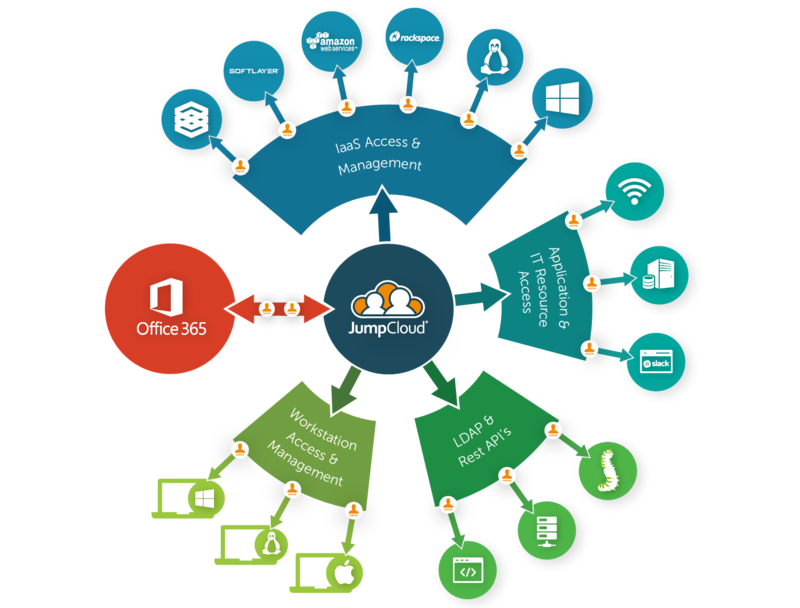 Your users can leverage the same Office 365 credentials on their systems (Windows, Mac, or Linux), for their cloud and legacy applications, and for their WiFi network connection. In short, Office 365 and Directory-as-a-Service are integrated to form a central identity provider that IT organizations leverage. The benefits to users are significant – less friction to get access to all of the IT resources they need. 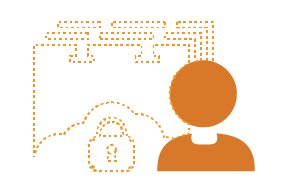 For IT organizations, they get increased security, a systematic approach to user management, and a centralize identity provider. 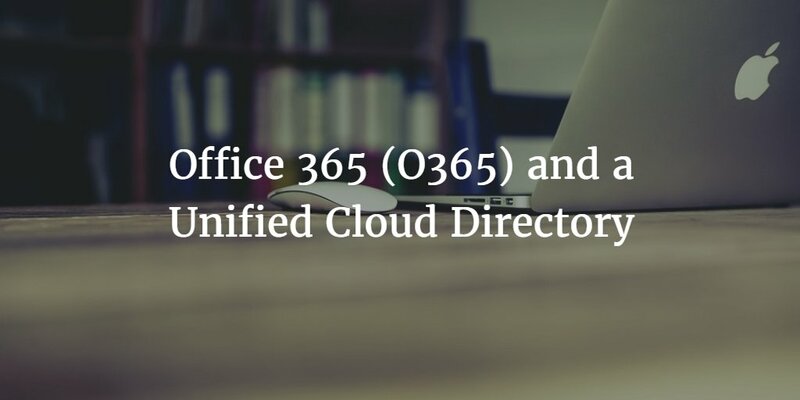 If you would like to learn more about how Office 365 and a unified cloud directory called Directory-as-a-Service can support your organization, drop us a note. Or, feel free to give JumpCloud a try – your first 10 users are free forever.